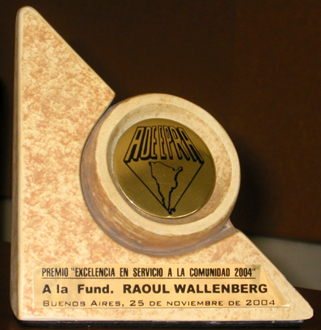 At a ceremony carried out on 25 November 2004 at the Olivos Yacht Club in Buenos Aires, the Argentine Association of Private Education (AAPE) distinguished the International Raoul Wallenberg Foundation with the ”2004 Excellence” award due to the services brought to the community through its educational programme”Wallenberg at school”. Jean Pierre Bendahan and Rodrigo Rendo, volunteers of the programme that aims at promoting the values of solidarity and civil courage, ethical pillars of the Saviours of the Holocaust, received the award. The ”Wallenberg at School” Programme started its activities in 2001 and is sponsored by the City of Buenos Aires. ”Education is the main topic that summons us on a daily basis. We share the principles of the World Conference that deal with ”Education for everyone”, particulary the one that refers to education as the essence of any strategy that aims at reducing the levels of poverty in the world. 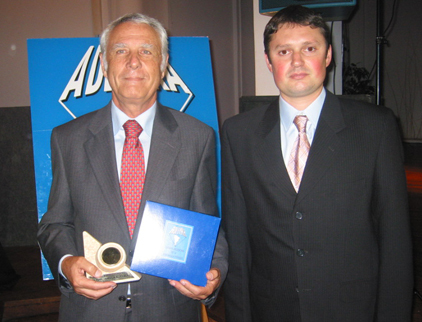 We know that when people have greater access to education they obtain a deeper understanding of their rights”, said Edgardo de Vincenzi, President of AAPE. The Programme ”Wallenberg at School” is expected to expand its presentations to more schools as of the year 2005, incorporating new pedagogical and communication tools.